Maidenhair ferns are delicate ferns with very small fronds and a lacy appearance. These are considered hardy ferns, rather than tropical ferns, but don't let the description fool you: these can be difficult plants to keep healthy indoors and are quite particular about their growing conditions. The maidenhair fern is part of the Adiantum genus that includes over 200 varieties of ferns that grow around the world. The genus name is derived from the Greek word "adiantos," which means "unwetted," and is an apt description since the leaves of the maidenhair fern repel water. This plant has delicate fan-shaped leaf segments that are typically clustered on wiry black stems. Maidenhair ferns are known to grow in places where other plants typically don't—they can naturally be found on rock walls and in between rock fissures where the moisture from water seepage keeps them alive. These plants require some specific surroundings to thrive indoors. Maidenhair ferns need shady settings. Do not expose them to any direct sunlight, and especially avoid bright light. This plant requires humid warm air. It will die or wilt with dry, hot air. To achieve the right watering conditions, mist the plant with warm water a couple of times a day. This will maintain moisture on the leaves. Additionally, keep the soil damp but not soggy. A humidifier or pebble tray can maintain optimal indoor growing conditions. Many growers have success keeping these plants in a shady corner or under a plant bench in glassed-in solariums or sunrooms. Since maidenhair ferns thrive on moisture, it's recommended to plant it in a pot with drainage holes. Ideally, keep the fern in a plastic pot with holes, and then put the plastic pot in a more attractive outer pot. This will allow you to easily check the moisture levels in the plastic pot. The drainage holes should prevent the soil from becoming soggy. 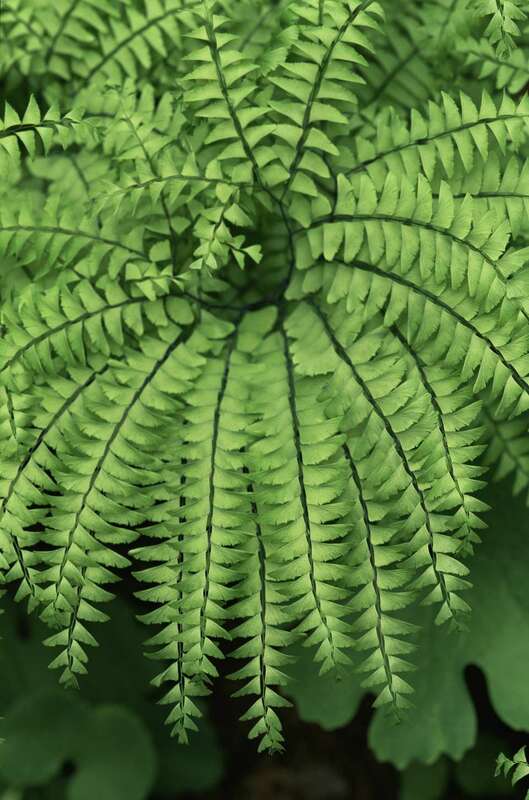 These plants are best kept above 70 F. Do not expose them to cold drafts or temperatures below 60 F. If you choose to fertilize your fern, do so with weak liquid fertilizer twice a week, only during the growing season and not in the winter months. These plants can be repotted annually or biannually, depending on the pot size and growth rate. They don't mind being a little crowded. Do repot them when the roots fill the pot. To repot successfully, use a knife or spade to divide the roots. Maintain a minimum of two to three healthy fronds within each division. Plant each section into its own pot, and be sure to water them well. Do not fertilize the repotted ferns right away, as this may burn the roots. Maidenhair ferns are somewhat finicky plants to maintain indoors. If the fern leaves are curling up, the leaf tips are dry, or the leaves are falling off frequently, these signs likely indicate that the air is too dry and the plant needs more moisture and humidity. If the green leaves are turning brown, this could indicate that the plant is being watered with hard water or that it is receiving too much direct sunlight. It is recommended that dry or yellowing leaves be gently cut. Regular trimming will help the fern grow denser foliage.